In Nada Te Turbe, Hermana Glenda presents 15 songs to strengthen our faith during turbulent times and helps us reconnect with God and with our spirituality. It is almost impossible not to be moved by the voice, words and melodies of Hermana Glenda. Many of the songs in this collection fill us with comfort and hope. Such is the case with "El Señor Está Conmigo" and "Tú Conoces Mi Canto". "Nada Te Turbe," the title song of the collection, is inspired by the poem of Saint Teresa of Ávila. With Hermana Glenda's voice, the text acquires a new depth, inviting us to leave our fears and worries in the hands of God. Song after song, Hermana Glenda’s voice inspires peace and her texts spark our faith. Some examples of this are “Por el Dolor Creyente,” a song that pleads for mercy and forgiveness to Our Lord, and "Transparente," a wish that we can be completely honest with our Father, with others, and even with ourselves. “Yo He Sentido Señor” and "Mentes Cansadas" are hymns for Liturgy of the Hours that will connect with all believers. The hymn "Te Está Cantando el Martillo" moves us to spread the Gospel to all corners of the earth. The Vespers hymn “Porque Es Tarde Dios Mío” is an example of Hermana Glenda combining official Spanish texts with beautiful melodies. "Hijo Pródigo" is the well-known Prodigal Son parable, but now from the perspective of the son, who longs to return home and find in his father's smile a new axis to change his life. While "Cantico de Simeón" (inspired by Lk 2:29-32) is ideal for the Feast of the Presentation of the Lord, "Nos Ha Nacido un Niño" is a Christmas song to reflect on the arrival of our Savior. Finally, "Pregón Pascual" is a victorious Easter song that rejoices in the resurrection of our Lord. 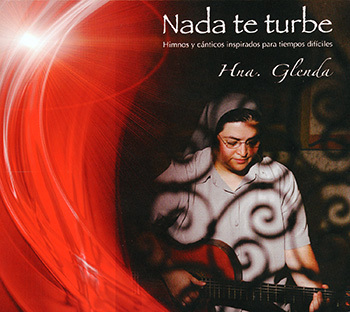 Just as Saint Teresa of Ávila and her poem "Nada Te Turbe" have been models in the ways of prayer and perfection, Hermana Glenda offers perfect songs that steer our hearts up in prayer and reflection.